Writing is a form of communication through the act of preserving text on a medium, with the use of signs or symbols. It is in principle the representation of language, rather than images of thought directly. In that regard, it is to be distinguished from pictography such as cave drawings and paintings on the one hand, and recorded speech such as tape recordings and movies, on the other. The development of writing can be understood as the effort to map the complexity of language into an efficient form that communicates as closely as possible the meaning of the spoken language, but also preserves it so that others can read and learn from it at a later time. Writing can take several forms: logographies typically developed from pictograophy, and require thousands of symbols each representing whole words; phonographic systems use symbols for words of similar sound, and may evolve to develop syllabaries; an alphabet provides symbols for all the consonants and vowels that are used to spell words, in more or less phonetic fashion. While recordings of speech became possible through modern advances in technology, writing nonetheless maintains its place in human society, fulfilling many functions beyond those carried out by spoken language. 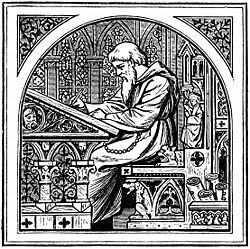 First invented by the early civilizations, writing is one of the most uniquely human cultural developments. Different writing systems reflect the historical times, the cultures, and variety of ways that human ingenuity devises to accomplish the goal. Writing continues to be an essential life skill today, used by the majority of people around the world, in average daily-life activities, as well as in professional and creative capacities. Efforts to achieve universal literacy are a high priority in contemporary society, as humankind develops a greater awareness of universal human rights and a desire to live harmoniously together in a world of peace. Writing refers to two activities: writing as a noun, the thing that is written; and writing as the verb, which designates the activity of writing. It refers to the inscription of characters on a medium, thereby forming words, and larger units of language, known as texts. It also refers to the creation of meaning and the information thereby. In that regard, linguistics (and related sciences) distinguishes between the written language and the spoken language. The significance of the medium by which meaning and information is conveyed is indicated by the distinction that is made in the arts and sciences; for example, in speech, or speaking: public speaking is a distinctly different activity, as is poetry reading; the former is governed by the rules of rhetoric, while the latter by poetics. Writing systems always develop and change based on the needs of the people who use them. Sometimes the shape, orientation and meaning of individual signs also changes over time. By tracing the development of a script it is possible to learn about the needs of the people who used the script as well as how it changed over time. Letter and word recording used to presuppose penmanship, and in earlier times, there were professional scribes who were especially skilled in that regard. The many tools and writing materials used throughout history include stone tablets, clay tablets, wax tablets, vellum, parchment, paper, copperplate, styluses, quills, ink brushes, pencils, pens, and many styles of lithography. In more recent times, a variety of machines have been introduced to aid the writer, from the typewriter to computer the use of a keyboard has changed the skills required. Later developments include voice recognition software which blurs the distinction between recording spoken words and the act of writing by allowing the "writer" to merely speak the words from which the machine prepares a written text. Writing is a distinctly human activity. It has been said that a monkey, randomly typing away on a typewriter (in the days when typewriters replaced the pen or plume as the preferred instrument of writing) could re-create Shakespeare—but only if it lived long enough (this is known as the infinite monkey theorem). Such writing has been speculatively designated as coincidental. Some have speculated that extra-terrestrial beings exist who may possess writing. The fact is, however, that the only known writing is human writing. A writer is anyone who creates a written work, although the word more usually designates those who write creatively or professionally, or those who have written in many different forms. The word is almost synonymous with author, although somebody who writes, say, a laundry list, could technically be called the writer of the list, but not an author. Skilled writers are able to use language to portray ideas and images, whether producing fiction or non-fiction. A writer may compose in many different forms, including (but certainly not limited to) poetry, prose, or music. Accordingly, a writer in a specialist mode may rank as a poet, novelist, composer, lyricist, playwright, mythographer, journalist, film scriptwriter, and so forth. Writers' output frequently contributes to the cultural content of a society, and that society may value its writerly corpus—or literature—as an art much like the visual arts (painting, sculpture, photography), music, craft, and performance art (drama, theater, opera, musical). The major writing systems—methods of inscription—broadly fall into four categories: logographic, syllabic, alphabetic, and featural. Another category, ideographic (symbols for ideas), has never been developed sufficiently to represent language. A sixth, pictographic, is insufficient to represent language on its own, but often forms the core of logographies. A logogram is a written character which represents a word or morpheme. The vast number of logograms needed to write language, and the many years required to learn them, are the major disadvantage of the logographic systems over alphabetic systems. However, the efficiency of reading logographic writing once it is learned is a major advantage. No writing system is wholly logographic: all have phonetic components (such as Chinese Pinyin or Hanyu Pinyin) as well as logograms ("logosyllabic" components in the case of Chinese characters, cuneiform, and Mayan, where a glyph may stand for a morpheme, a syllable, or both; "logoconsonantal" in the case of hieroglyphs), and many have an ideographic component (Chinese "radicals," hieroglyphic "determiners"). For example, in Mayan, the glyph for "fin," pronounced "ka'," was used to represent the syllable "ka" whenever clarification was needed. However, such phonetic elements complement the logographic elements, rather than vice versa. The main logographic system in use today is Chinese characters, used with some modification for various languages of China, Japanese, and Korean. A syllabary is a set of written symbols that represent (or approximate) syllables. A glyph in a syllabary typically represents a consonant followed by a vowel, or just a vowel alone, though in some scripts more complex syllables (such as consonant-vowel-consonant, or consonant-consonant-vowel) may have dedicated glyphs. Phonetically related syllables are not so indicated in the script. For instance, the syllable "ka" may look nothing like the syllable "ki," nor will syllables with the same vowels be similar. Syllabaries are best suited to languages with relatively simple syllable structure, such as Japanese, which uses hiragana and katakana syllabaries in addition to the logographic Chinese characters (Kanji). Other languages that use syllabic writing include the Linear B script for Mycenaean Greek; Cherokee; Ndjuka, an English-based creole language of Surinam; and the Vai script of Liberia. A featural script notates the building blocks of the phonemes that make up a language. For instance, all sounds pronounced with the lips ("labial" sounds) may have some element in common. In the Latin alphabet, this is accidentally the case with the letters "b" and "p"; however, labial "m" is completely dissimilar, and the similar-looking "q" is not labial. In Korean Hangul, however, all four labial consonants are based on the same basic element. However, in practice, Korean is learned by children as an ordinary alphabet, and the featural elements tend to pass unnoticed. Another featural script is SignWriting, the most popular writing system for many sign languages, where the shapes and movements of the hands and face are represented iconically. Featural scripts are also common in fictional or invented systems, such as Tolkien's Tengwar. 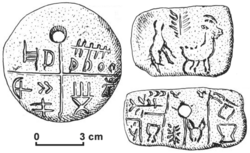 The Tărtăria tablets discovered in Romania with inscriptions believed to be from the Vinča culture. The early writing systems of the late fourth millennium B.C.E. were not a sudden invention. They were rather based on ancient traditions of symbol systems that cannot be classified as writing proper, but have many characteristics strikingly reminiscent of writing, so that they may be described as "proto-writing." They may have been systems of ideographic and/or early mnemonic symbols that allowed to convey certain information, but they are probably devoid of linguistic information. These systems emerge from the early Neolithic, as early as the seventh millennium B.C.E., if not earlier. Notably the Vinca script shows an evolution of simple symbols beginning in the seventh millennium, gradually increasing in complexity throughout the sixth millennium and culminating in the Tărtăria tablets of the fifth millennium with their rows of symbols carefully aligned, evoking the impression of a "text." The hieroglyphic scripts of the Ancient Near East (Egyptian, Sumerian proto-Cuneiform, and Cretan) seamlessly emerge from such symbol systems, so that it is difficult to say, already because very little is known about the symbols' meanings, at what point precisely writing emerges from proto-writing. In 2003, seventh millennium B.C.E. radiocarbon dated symbols Jiahu Script carved into tortoise shells were discovered in China. The shells were found buried with human remains in 24 Neolithic graves unearthed at Jiahu, Henan province, northern China. According to some archaeologists, the writing on the shells had similarities to the second millennium B.C.E. Oracle bone script. The fourth millennium B.C.E. Indus script may similarly constitute proto-writing, possibly already influenced by the emergence of writing in Mesopotamia. The original Sumerian writing system was derived from a system of clay tokens used to represent commodities. By the end of the fourth millennium B.C.E., this had evolved into a method of keeping accounts, using a round-shaped stylus impressed into soft clay at different angles for recording numbers. This was gradually augmented with pictographic writing using a sharp stylus to indicate what was being counted. Round-stylus and sharp-stylus writing was gradually replaced about 2700-2500 B.C.E. by writing using a wedge-shaped stylus (hence the term cuneiform), at first only for logograms, but developed to include phonetic elements by the twenty-ninth century B.C.E. About 2600 B.C.E. cuneiform began to represent syllables of the Sumerian language. Finally, cuneiform writing became a general purpose writing system for logograms, syllables, and numbers. From the twenty-sixth century B.C.E., this script was adapted to the Akkadian language, and from there to others such as Hurrian and Hittite. Scripts similar in appearance to this writing system include those for Ugaritic and Old Persian. The earliest known hieroglyphic inscriptions date to c. 3200 B.C.E., on such as the Narmer Palette, though the glyphs were based on a much older artistic tradition. The hieroglyphic script was logographic with phonetic adjuncts that included an effective alphabet. The world's oldest known alphabet was developed in central Egypt around 2000 B.C.E. from a hieroglyphic prototype, and over the next 500 years spread to Canaan and eventually to the rest of the world. Writings on tortoise shells discovered in modern China were dated ca 6600 B.C.E. In China the early Chinese dynasties left behind many written documents. From the Shang Dynasty most of this writing has survived on bones or bronze implements. 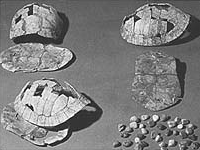 Markings on turtle shells, or jiaguwen, have been carbon-dated to around 1500 B.C.E. Historians have found that the type of media used had an effect on what the writing was documenting and how it was used. There have been discoveries of tortoise-shell carvings dating back to c. 6000 B.C.E., like Jiahu Script, Banpo Script, but whether or not the carvings are of sufficient complexity to qualify as writing is under debate. If it is deemed to be a written language, writing in China will predate Mesopotamian cuneiform, long acknowledged as the first appearance of writing, by some 2000 years, however it is more likely that the inscriptions are rather a form of proto-writing, similar to the contemporary European Vinca script. Undisputed evidence of writing in China dates from ca. 1600 B.C.E. The Middle Bronze Age Indus script dates back to the early Harrapan phase of around 3000 B.C.E. It is unclear whether it should be considered an example of proto-writing (a system of symbols or similar), or if it is actual writing of the logographic-syllabic type of the other Bronze Age writing systems. The first pure alphabets (properly, "abjads," mapping single symbols to single phonemes, but not necessarily each phoneme to a symbol) emerged around 1800 B.C.E. 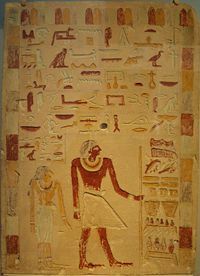 in Ancient Egypt, as a representation of language developed by Semitic workers in Egypt. These early abjads remained of marginal importance for several centuries, and it is only towards the end of the Bronze Age that the Proto-Sinaitic script splits into the Proto-Canaanite alphabet (ca. 1400 B.C.E.) Byblos syllabary and the South Arabian alphabet (ca. 1200 B.C.E.). The Proto-Canaanite was probably somehow influenced by the un-deciphered Byblos syllabary and in turn inspired the Ugaritic alphabet (ca. 1300 B.C.E.). The Phoenician writing system was adapted from the Proto-Caananite script in around the eleventh century B.C.E., which in turn borrowed ideas from Egyptian hieroglyphics. This writing system was an abjad—that is, a writing system in which only consonants are represented. This script was adapted by the Greeks, who adapted certain consonantal signs to represent their vowels. This alphabet in turn was adapted by various peoples to write their own language, resulting in the Etruscan alphabet, and its own descendants, such as the Latin alphabet and Runes. Other descendants from the Greek alphabet include the Cyrillic alphabet, used to write Russian, among others. The Phoenician system was also adapted into the Aramaic script, from which the Hebrew script and also that of Arabic are descended. 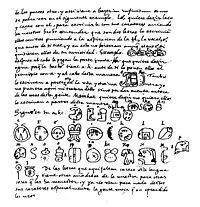 Of several pre-Colombian scripts in Mesoamerica, the one that appears to have been best developed, and the only one to be deciphered, is the Maya script. The earliest inscriptions which are identifiably Maya date to the third century B.C.E., and writing was in continuous use until shortly after the arrival of the Spanish conquistadores in the sixteenth century C.E. Maya writing used logograms complemented by a set of syllabic glyphs, somewhat similar in function to modern Japanese writing. Literacy is usually defined as the ability to read and write, or the ability to use language to read, write, listen, and speak. In ancient times only a select few were truly literate, and therefore much of the writing was restricted to scribes, the clergy and ruling class. Those that could neither read nor write became dependent upon those who could; hence, literacy became a tool of power. It also, however, became an artistic tool, for as long as people have been literate, they have used the ability to write to express thoughts, feelings, and experiences in the form of written language. As literacy flourished later on, so to did the amount of writing that was being done and the rate of exchange of ideas over time and space increased dramatically. In modern contexts, literacy refers to reading and writing at a level adequate for communication, or at a level that lets one understand and communicate ideas in a literate society. Literacy is part of the development of individual maturity, allowing one to attain one's potential as a person, and an essential skill that allows one to be a fully functioning member of society. Twenty-first century consciousness, as evidenced for example in the United Nations Millennium Development Goals, regards literacy as an important skill that should be taught to all people. ↑ Logogram Encyclopædia Britannica. Retrieved October 26, 2007. ↑ Simon Ager, "Syllabaries" OMNIGLOT (1998). Retrieved October 26, 2007. ↑ 3.0 3.1 Archaeologists Rewrite History China Daily (June 12, 2003). Retrieved November 16, 2007. ↑ Cuneiform The Columbia Electronic Encyclopedia, Sixth Edition. (Columbia University Press, 2003). Retrieved October 27, 2007. ↑ David Whitehouse, 'Earliest writing' found BBC (1999). Retrieved November 16, 2007. ↑ Robert Hetzron, The Semitic Languages (Routledge, 2006, ISBN 0415412668). ↑ Maria Longhena and Rosanna M. Giammanco Frongia, Maya Script: A civilization and its writing (Abbeville Press, 2006, ISBN 0789208822). Hoffman, Joel M. 2006. In the Beginning: A Short History of the Hebrew Language. New York University Press. ISBN 978-0814736906. Saggs, H. 1991. Civilization Before Greece and Rome. Yale University Press. ISBN 978-0300050318. Egyptian hieroglyphs c. 3000 B.C.E. This page was last modified on 19 August 2016, at 22:13.